Spring is the season of growth, renewal, and repair. Winter’s cold, snow, and ice disappear, leaving chaos behind. 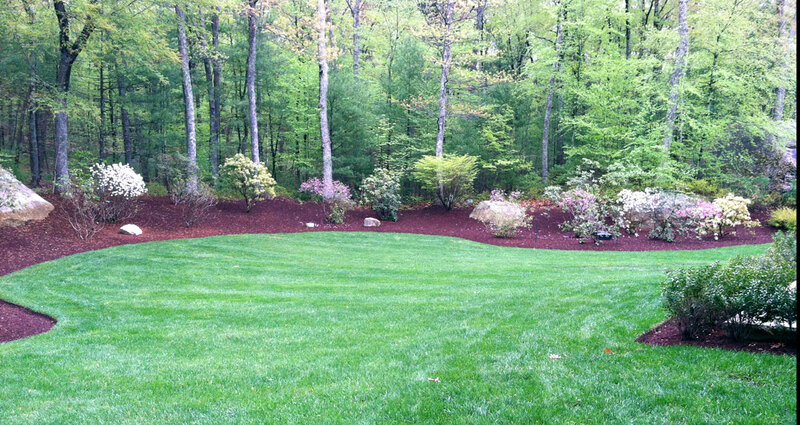 A spring clean up will help your turf and landscape recover from winter and look beautiful again. Mulching – Neatly mulched beds improve the appearance of any landscape. But beyond its appearance, a layer of mulch provides many other benefits. Mulch protects the plants’ root systems, slows the erosion of topsoil, and helps to prevent weeds and retain moisture. At the same time a granular pre-emergent weed control in all the beds to aid in reduction of cool season weeds growth. MFL uses a bark blowing machine. Very few of our competitors offer this service. The advantages of having mulch blown is that there is a lot less clean-up and we are on your property for at least half the amount of time as hand spreading. It is more efficient, allows mulch to be spread more evenly, and has a more consistent finished look. The machine gives us the capability to spread up to 100 yards of mulch per day. Deep-root feed all the ornamental trees shrubs and perennials with a slow release organic fertilizer, which is spread around the root drip zone and allowed to release slowly into the soil to encourage root and shoot growth. The fertilizer also consists of super phosphate which is the element needed to create strong flower buds and aid in the prolific flowering of trees, shrubs and perennials. This is also done at the time of spring cleanup to allow longer lasting results and time for absorption into the soil and therefore the plants. Dethatching is essential to maintain a lush, healthy lawn. Thatch is the layer of built-up plant material between the green top growth and the roots of grass plants. A thin layer of thatch, ½”,is normal, even healthy. A layer of ½” or more, prevents air, light, and water from reaching the turf’s root zone. We use professional power rakes to comb out the right amount of dead materials which is then raked up and removed. This is not a ‘pretty’ process but is necessary for improved fertilizer absorption, a better root system, and a green, healthy lawn. Mowing on an as needed basis to maintain a 2 ½” – 3” height, not to exceed 7 days between mowing to maintain a neat, clean appearance, weather permitting. Weed whacking around all buildings, planting beds, utilities, trees, etc. Blowing off all walkways, drives and patios to remove clippings, leaves, and debris. Lawns need regular fertilization to keep the grass growing and weeds out. 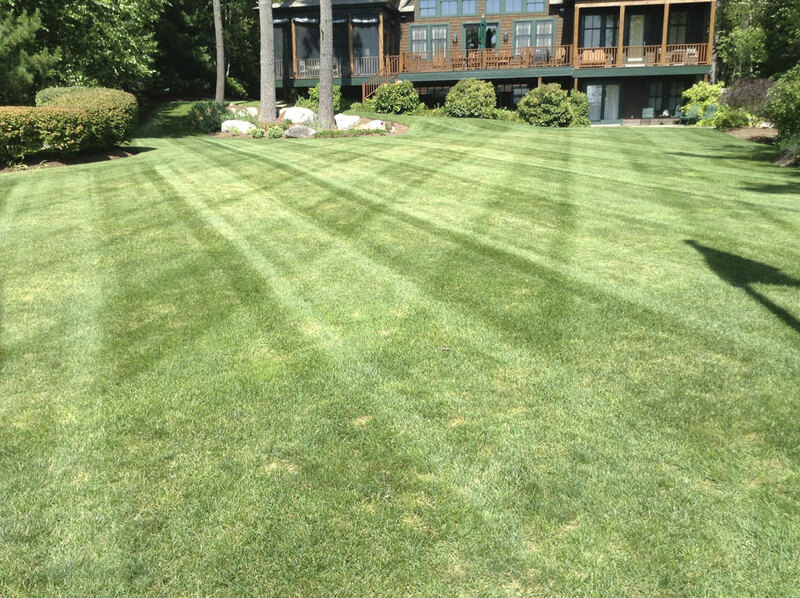 When done properly, it has a major positive impact on lawn appearance. We use a five step semi-organic fertilizer application and a one time lime application. This promotes root growth, aids in the recovery from foot and equipment traffic and pest damage, reduces and controls weeds, and replaces nutrients lost to leaching. This is a customized garden program to care for the lawn and landscaped areas of your property. This service generally runs from May – October.